Hall of Femmes was founded in 2009 by Samira Bouabana and Angela Tillman Sperandio, who wanted to highlight the work of women in the design industry whose story and work often gets neglected in the design history books. Though Hall of Femmes has different avenues of sharing these rich stories, like through events, interviews, and podcasts, they’re most well known for their Hall of Femmes book series—with each well-designed and beautifully printed book dedicated to the featured woman of honor. You can find more information about them on their website, or visit their kickstarter page that helped put this lovely little book into the hands of others. The life of Barbara Stauffacher Solomon is a full one, and one that seems like it can only exist in a dream about what a life in design could be, as we try to forget our existing realities of the day to day job. Her career in design didn’t begin until the death of her first husband—as a newly widowed mother, the demand to make a living and provide for her and her daughter was of the most importance and knew design could provide such an opportunity with its commercial nature. This life-altering event and decision resulted in her moving to Switzerland to study graphic design under the legendary designer, Armin Hoffman, before moving back to the states to start her studio in San Francisco, where she brought Swiss modernist design training into a city full of free-flowing hippie graphics. How did you deal with the situation, being so young? I was lonely, I missed my husband, I adored my husband and he died. He was 39, I was 26, our daughter was 3. Somehow, in that world of men and dope I had a strong sense of self-preservation. I might have gone to hell but instead I went to Switzerland. 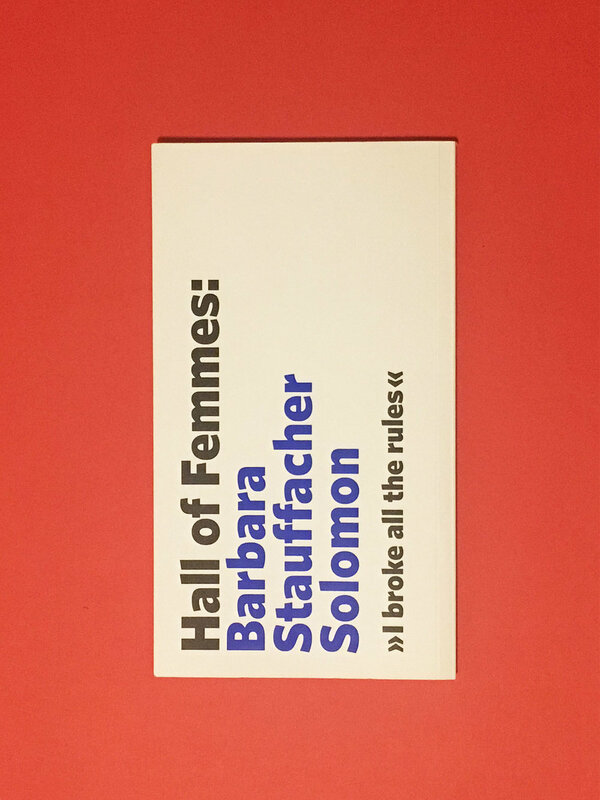 Hall of Femmes feature on Barbara Stauffacher Solomon encapsulates this rich history in a dreamy introduction by Malin Zimm, who sets the tone by giving us a glimpse into defining moments that shaped the designer’s career before we get to the heart of the book—the interview. Yes, the Hall of Femmes series follows an interview format, which makes the content considerably easy to digest and less of a time investment for a passive reader, keeping the book short and sweet, entirely composed at 72 pages. Flattering images of her youth, iconic design work, and the latest photographs of her and her work grace the pages, breaking up the interview by providing context and adding value to the page while displaying the element of scale and how it played a significant role in her work. Did Switzerland measure up to your expectations of order and structure? Armin taught us to always make clear solutions. »Learn the rules«, he said. »Follow them. Later, if you are brilliant enough, you can break them.« In Switzerland, you weren’t supposed to be original. You were supposed to learn. At the Kunstgewerbeschule you would sit in rows in the classrooms, like a labratory, doing your exercises. You would be working on a lower case »a« for example, placing it on a grid, and Armin would walk by and without a word he would get you to stand up, and he’d sit down and white-out your sketch, correcting you to the absolute balance of that letter. Armin was there to teach us how to do it his way. And eventually you would learn how to do it Armin’s way. Together, this photo/interview format would typically do well to remain on a blog or in a print magazine, as its format is quick and enjoyable consume, but therefore risks the chance of being quickly forgotten. This well-designed book series, however, makes it so that is not the case for these women, as this series ultimately helps clear a space on the shelf in the history of design for them (and essentially building a custom archive), while other design books remain rife with the works and stories of pioneering men—but this can’t be the only point of reference we have. Interviews are fleeting and can only capture a fraction of the story with answers and questions impacted by countless variables of circumstance and patience, even when well executed like Hall of Femmes. Upon reading this book, I’ve found myself further staunch in my belief that the personal narrative is of most significance when one has the ability write it and write it well (if they want to share it with the world, of course), and can be crucial when considering the number of stories ignored or forgotten, while the same stories of a select few continue to be told ad nauseam. Reading Barbara Stauffacher Solomon’s autobiographical text, Why, Why Not? prior to the Hall of Femmes, interview helped prove this point. I was looking for lengthier dialogue within this book but eventually found the importance of it in its presence alone and its sheer opportunity to share a concise, but in-depth, conversation with legendary designers—however, we need both works of writing to help make a story complete. So really, it’s a collage? Yes, it’s all a collage. An infinite collection of infinate collages. That is my thesis. What happened to happen eighty years ago will cause me to make this line or that on a page today. What more can I say? *I was able to photograph some of the supergraphics here—though as the book notes, over time they were refurbished without her knowledge by a designer other than herself.